Properties in Crummock Water average 4.6 out of 5 stars. Property 6: GRASMERE, Hollens Farm Cottage sleeps 4, close to village, parking and WiFi inc. Spacious & comfortable, 2 Bedroom Cottage In Keswick, great location. Property 11: Spacious & comfortable, 2 Bedroom Cottage In Keswick, great location. Lookfar. 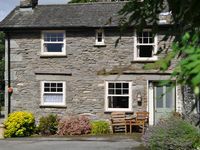 Ambleside cottage with wonderful views in the heart of the village. Property 19: Lookfar. Ambleside cottage with wonderful views in the heart of the village. Beautiful timber lodge, nestled in tranquil wildlife haven with mountain views. Property 23: Beautiful timber lodge, nestled in tranquil wildlife haven with mountain views. Where Lewis Carroll was inspired to write Alice in Wonderland...! Property 24: Where Lewis Carroll was inspired to write Alice in Wonderland...! Family Run Cosy 2 Bed Bungalow Set In Keswick The Heart Of The Lake District. Property 30: Family Run Cosy 2 Bed Bungalow Set In Keswick The Heart Of The Lake District. THIRLMERE LODGE, nr Ambleside . Central Lakes log cabin. Free use of pool/sauna. Property 35: THIRLMERE LODGE, nr Ambleside . Central Lakes log cabin. Free use of pool/sauna. Large farmhouse - panoramic views, fab walking & biking, dog friendly, hot tub..
Property 42: Large farmhouse - panoramic views, fab walking & biking, dog friendly, hot tub.. This was an adorable place to stay with easy access to everything in The Lake District. Incredible hikes through rolling hills just steps away from the front door and a pleasant stroll down to the lake front. This was a wonderful experience thanks to Lorraine and Chris. This was our first visit to the Lake District and we loved it! Hollens Farm Cottage was wonderful! Characterful and homely. Aga and wood burner made the cottage warm and cozy after long walks. Cottage provided plenty of room and everything we needed. Everything within walking distance. We will definitely return!